THE OAKLAND ATHLETICS have hired Major League Baseball’s first female coach in another progressive sign that women are slowly gaining acceptance in high-profile roles in men’s sport. 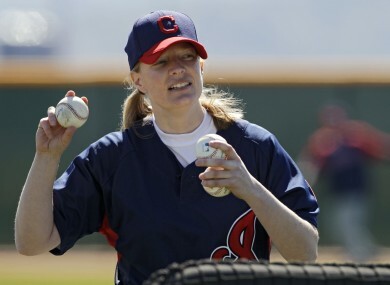 Justine Siegal will be part of Oakland’s coaching staff for their Instructional League Club campaign which begins next month after signing a two-year contract. The 40-year-old has coached in collegiate and independent baseball and was the first woman to throw batting practice for MLB teams. She is also the first woman to coach professional baseball and David Forst, A’s assistant general manager, admits Siegal has a a lot to offer. The A’s became one of the first teams to employ a woman in a coaching capacity when they appointed Kate Greenthal as a scouting assistant in 2012. It’s become more and more common and this appointment is another encouraging, and groundbreaking, one. Email “MLB team make history by becoming first organisation to appoint female coach ”. Feedback on “MLB team make history by becoming first organisation to appoint female coach ”.